Study from 2017 shows that the DTP vaccine actually kills more people than it actually "saves", shocking study finds. The child population had been followed with 3-monthly nutritional weighing sessions since 1978. From June 1981 DTP and OPV were offered from 3 months of age at these sessions. Due to the 3-monthly intervals between sessions, the children were allocated by birthday in a ‘natural experiment’ to receive vaccinations early or late between 3 and 5 months of age. We included children who were < 6 months of age when vaccinations started and children born until the end of December 1983. We compared mortality between 3 and 5 months of age of DTP-vaccinated and not-yet-DTP-vaccinated children in Cox proportional hazard models. Among 3–5-month-old children, having received DTP (± OPV) was associated with a mortality hazard ratio (HR) of 5.00 (95% CI 1.53–16.3) compared with not-yet-DTP-vaccinated children. Differences in background factors did not explain the effect. The negative effect was particularly strong for children who had received DTP-only and no OPV (HR = 10.0 (2.61–38.6)). All-cause infant mortality after 3 months of age increased after the introduction of these vaccines (HR = 2.12 (1.07–4.19)). Individually randomized studies to measure impact on child survival of different vaccines were not conducted when the Expanded Program on Immunization (EPI) was introduced in low-income countries in the 1970s. The disease-protective effects were well documented, so the main issue was at which age to introduce the vaccine most effectively (The Expanded Programme on Immunization, 1982). Except for measles vaccine (MV), surprisingly few studies examined the introduction of vaccines and their impact on child survival (Aaby et al., 1983, Aaby et al., 2003a, Holt et al., 1990, The Kasongo Project Team, 1981). One trial of measles-vaccinated and measles-unvaccinated communities in Congo showed a larger than expected reduction in child mortality (Aaby et al., 1981); this observation was subsequently corroborated by community “trials” and before-after studies in several countries (Aaby et al., 1984, Aaby et al., 1993, Aaby et al., 2003a, Holt et al., 1990, Kapoor and Reddaiah, 1991). Hence, a vaccine may have non-specific effects (NSEs) on susceptibility to other infections (Aaby et al., 1995). WHO's Strategic Advisory Group of Experts on Immunization (SAGE) recently reviewed the potential NSEs of BCG, diphtheria-tetanus-pertussis (DTP) and MV and recommended further research (Higgins et al., 2014, Strategic Advisory Group of Experts on Immunization, 2014). Though protective against the target diseases, DTP may increase susceptibility to unrelated infections (Aaby et al., 2003b, Aaby et al., 2004a, Aaby et al., 2012) (Appendix A). The SAGE review noticed that the majority of studies found a detrimental effect of DTP (Higgins et al., 2014). However, SAGE considered the evidence inconsistent because two studies reported beneficial effects (Higgins et al., 2014) and that most studies underestimated the benefit of DTP because studies were conducted in situations with herd immunity. Furthermore, all studies gave DTP and OPV together, making it impossible to separate effects of DTP and OPV (SAGE non-specific effects of vaccines Working Group, 2014). On the other hand, the “unvaccinated” children in these studies have usually been frail children too sick or malnourish to get vaccinated, and the studies may therefore have underestimated the negative effect of DTP. We therefore examined what happened when DTP and OPV were first introduced, but not always given together, in 1981–1983 in the capital of Guinea-Bissau. In this situation the children were allocated by birthday to receive vaccines early or late and the “unvaccinated” were therefore not frail children. Bandim Health Project (BHP) has followed an urban community with a demographic surveillance system since December 1978, and took part in the introduction of vaccines well before a full-fledged national program was implemented with UNICEF support in 1986 (Aaby et al., 1984, Aaby et al., 2004a). 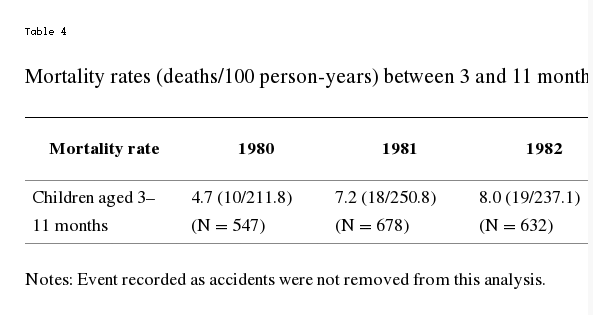 In 1978–1979, under-five mortality was nearly 500/1000. Since malnutrition was assumed to be the main cause, a study was initiated to determine why children were malnourished (Aaby et al., 1983). However, severe malnutrition was not evident, and to understand the high mortality we started a health and demographic surveillance system (HDSS). The area was mapped and a census conducted. Four health workers were employed to identify pregnant women, encourage women to attend ante-natal clinics, and to follow children with anthropometric measurements to assess growth patterns and detect malnourished children. Each health worker followed a population of 1500–2000 individuals. The health workers were supervised by an expatriate nurse. For each sub-district in Bandim, the responsible health worker kept a list of children under three years of age. BHP had no computerized surveillance system until 1990 but kept an A5 card (“BHP card”) for each child, where weights and vaccination dates were noted. The child's growth card was kept by the mother. The Bandim population was very mobile. It was important to maintain contact with the natal village for ceremonial purposes and to secure rice. Furthermore, mothers were not supposed to have sexual relations during breastfeeding (Jakobsen et al., 2004). Breastfeeding was prolonged in Guinea-Bissau. Thus, many women stayed in the rural areas with their natal family while breastfeeding. These cultural traditions introduced variability in the participation in weighing and vaccination sessions. We arranged quarterly weighing sessions in each sub-district. The responsible health worker advised mothers the day before a community weighing. The following morning, the weight was measured and noted on the child's growth card and the BHP card. When the World Food Program provided supplementary feeding this was given to families with malnourished children. There was no community vaccination program in 1981 except that we had organized a few measles vaccination campaigns (Aaby et al., 1984). Mothers could take their children to the Mother and Child Health Program in town. However, this clinic was mainly attended by the urban elite. Few children were vaccinated before BHP organized vaccination sessions (Table 1). Median age of vaccination and coverage for BCG, DTP and OPV of study cohort. In June 1981, BHP started to provide vaccinations at the quarterly weighing sessions. A health center nurse accompanied the weighing team and vaccinated eligible children. DTP and OPV were provided from 3 months and MV from 9 months of age. OPV-at-birth was not given then. The three DTP and OPV doses could be given with an interval of one month but since we only arranged weighing every three months, most children had longer intervals between doses. DTP was administered intramuscularly and OPV as an oral drop. When both vaccines were administered at the same session OPV was usually given first and then DTP; the children would usually start crying after DTP due to the pain of the injection and it would therefore have complicated the administration of OPV to give DTP first. There were several periods where either OPV or DTP was missing (Fig. 1). BCG was rarely provided at the weighing sessions since most nurses were not trained to administer intra-dermal vaccination. A total of 269 children may have been BCG vaccinated as they had a vaccination date on their card (N = 192) or were noted to have received BCG but no date given (N = 77). Each vaccination of the specified type is plotted according age of the recipient and date of vaccination. The expatriate nurse sometimes organized additional vaccination sessions in which the children were not weighed. During these sessions, vaccinations were noted on the BHP cards. Both nurses and mothers thought that sick children should not be vaccinated; the BHP card often indicated that the child was ‘sick’, ‘malnourished’ or ‘orphan’ as an explanation of why an age-eligible child had not been vaccinated. When a computerized system became available in 1990–1991, weights and vaccinations from the BHP cards were entered. For the present analysis, all information on dates of visit, weights and vaccination dates was checked against the original cards. A few cards were not available or could no longer be found (Fig. 2). Flowchart of study population and children included in the analyses. We included children born from December 3, 1980 as they would become eligible for vaccination before 6 months of age (Fig. 2). Few children were vaccinated with BCG (Table 1). Children who travelled and never attended any session were not included in the ‘unvaccinated’ group. Children weighed within a fortnight of their birth to obtain a birth weight were only included if they took part in a subsequent community weighing session. Furthermore, we excluded orphans since they were not breastfed and were likely to have different care. The cohort is depicted in Supplementary Fig. 1. Though not individually randomized, the present study is a natural experiment with limited bias in group allocation: With 3-monthly intervals between weighing sessions, children were allocated by their birthday to receive their first vaccinations early or late between 3 and 5 months of age (Fig. 3). We therefore compared 3–5-month-old children who had received DTP (± OPV) vaccinations early with children who had not yet received these vaccinations. Since there were no healthy “unvaccinated” children after 6 months of age unless they had travelled, we censored follow-up of all children at 6 months of age (Fig. 3). Sick children were not vaccinated, in the main analysis we therefore censored ‘unvaccinated’ children who attended a weighing session but did not receive a vaccination (Fig. 3). Since the censoring of sick children could have introduced a bias, we also conducted an intention-to-treat analysis in which the censored children were transferred to the DTP group. Hence, in this analysis we compared the mortality of the intended-DTP-vaccinated group and the not yet DTP-vaccinated group. Children were included from 91 days of age if they had been examined in a weighing session before 91 days; if they were only seen in a weighing session after 3 months of age they were only included from the day seen. DTP was not administered elsewhere and the follow-up time of children was therefore counted as DTP-unvaccinated time in the survival analysis until BHP provided the vaccine. Time as DTP-unvaccinated also came from children who did not turn up at the weighing sessions between 3 and 5 months of age but had been seen before 3 months of age and therefore were part of the community cohort (Fig. 3). Hence, the DTP-vaccinated and DTP-unvaccinated children were all children from the same cohort of children born in Bandim and their allocation depended on the timing of their birth date, the timing of the weighing sessions and their travelling pattern. We compared the background factors for the children who were DTP vaccinated, attended a weighing session between 3 and 5 months but were not vaccinated and those who did not attend a weighing session (Table 2). Background factors children in the main analysis of vaccination and mortality between 3 and 5 months of age. We also examined the mortality of children who due to logistic reasons had received DTP-only. Absences and travelling patterns are unlikely to differ between children who at their first vaccination had received DTP1 + OPV versus DTP1-only; these two groups were equally likely to receive subsequent vaccinations both with respect to timing of subsequent vaccinations and coverage (data available on request). First possible enrolment date was June 2, 1981, when DTP and OPV vaccinations were introduced. Different vaccination groups were compared using a Cox proportional hazard model with age as underlying time. Children were classified according to their most recent vaccination (Supplementary Table 1). We ignored BCG vaccinations in the main analysis because we gave few BCG vaccinations (Table 1) and some children had received BCG at the maternity ward without proper documentation as some children had a BCG scar but no vaccination card. To avoid survival bias, we used a landmark approach (Jensen et al., 2007); hence, a child's vaccination status was only updated from the day the information was collected. Due to the additional vaccination sessions organized by the expatriate nurse some “unvaccinated” children received a vaccine before the weighing session where they changed status to “vaccinated”; it is noted in the footnote to Table 3 how many had received such vaccinations. As a sensitivity analysis we also did an analysis including the additional vaccination sessions as landmarks. For the remainder of this paper, we will refer to these landmarks as vaccination-days-without-weighing. Mortality rate and hazard rate (HR) for children from 3 months of age until first examination without vaccination or 6 months of age. Natural experiment. The WHO z-score for weight-for-age was used to assess nutritional status. Control for sub-district, ethnic group and twinning did not change the results (data not shown). There was no obvious clustering of deaths and control for season and calendar time did not change estimates (data not shown). There were 18 deaths between 3 and 5 months of age: 3 had cough and respiratory infections as the main symptom, 3 had fever (presumed malaria), 2 were due to diarrhea, 5 had diarrhea and vomiting, 1 was a sudden death, and 4 had no information on cause. The study of nutritional status was planned by SAREC (Swedish Agency for Research Collaboration with Developing Countries) and the Ministry of Health in Guinea-Bissau. Of 1356 children registered in Bandim and followed to 3 months of age (Fig. 2), 286 were never weighed, had no card or their card was lost. An additional 13 children had inconsistent information, vaccinations marked with a cross but without dates or were orphans. Hence, 1057 children were included in the study cohort. The median ages for DTP1 and OPV1 were 121 and 118 days, respectively (Table 1). The vaccination coverage at 6 months of age was 55% for DTP1; 3% got DTP3 (Table 1). Coverage for MV was only 6%. Of the DTP1, OPV1 and MV vaccinations noted on the BHP card 90–95% had been administered by the BHP. For children examined after 91 days, a one-unit increase in w/a z-score was associated with an odds ratio of 1.07 (0.93–1.24) for receiving a vaccination at that weighing session. There were no marked differences in background factors for the three groups of children who were DTP vaccinated at 3–5 months of age, those who attended a weighing session but were not vaccinated, and those who did not attend a weighing session at 3–5 months of age (Table 2). Birth weight was similar in the three groups. Weight-for-age z-score before 3 months of age did not differ for the three groups (Table 2). Those who did not attend a weighing session at 3–5 months of age were significantly less likely to attend later weighing sessions during infancy, the mean number of visits being lower for those not attending than for those being DTP-vaccinated (p < 0.001) (Table 2); hence, they are likely to have travelled more than those who were DTP-vaccinated. In the main experiment depicted in Fig. 3, DTP vaccination (± OPV) compared with ‘DTP-unvaccinated’ was associated with a HR of 5.00 (1.53–16.3) (Table 3); the HR was 9.98 (0.81–123) for girls and 3.93 (1.01–15.3) for boys. If we also included vaccinations given on vaccinations-days-without-weighing in the landmark analysis, DTP (± OPV) compared with unvaccinated was associated with a HR of 3.90 (1.20–12.3). When DTP had been given alone without OPV the HR was 10.0 (2.61–38.6) (Table 3). The difference between DTP-only children and DTP-plus-OPV does not reflect differences in follow-up and other vaccinations since the time to DTP2 and prevalence of DTP2 was the same for DTP-only and DTP-plus-OPV vaccinated children (data not shown). If we excluded the 269 children who may have been BCG vaccinated results were similar (Supplementary Table 2). If the analysis was conducted as an intention-to-treat analysis in which the children weighed but not vaccinated were not censored but transferred to the DTP group, the intended-DTP-vaccinated group had a HR of 3.92 (1.20–12.8) compared with the not-yet vaccinated group (Supplementary Table 3). Since the introduction of DTP and OPV apparently was associated with increased mortality, we examined what happened to infant mortality from 3 to 12 months of age after the introduction of these vaccines. The mortality rate for all 3–11 months old children increased 2-fold (HR = 2.12 (1.07–4.19)) from 1980, before vaccinations, to 1982–1983, after the introduction of DTP and OPV (Table 4). DTP vaccinations were associated with increased infant mortality even though there was no vaccine-induced herd immunity. When unvaccinated controls were normal children who had not yet been eligible for vaccination, mortality was 5 times higher for DTP-vaccinated children. Co-administration of OPV with DTP may have reduced the negative effects of DTP. The present analysis assessed DTP and child survival in a “natural experiment” in which the children were allocated by the timing of their birth and community weighing sessions and the group allocation was therefore not influenced by the usual selection biases to the same extent as most other studies of DTP (Aaby et al., 2016). To assure that the censoring from the main analysis of children who were not vaccinated had not produced the unexpected strong result we made an intention-to-treat analysis but this did not change the result. If anything the unvaccinated children had slightly worse nutritional status before 3 months of age than the children who were subsequently DTP vaccinated (p = 0.09) (Table 2); the unvaccinated children travelled more than the DTP vaccinated children. These biases would tend to favor rather than increase mortality in the DTP group and the estimates from the natural experiment may therefore still be conservative. The estimated effects of DTP and OPV are unlikely to have been influenced by other vaccinations since very few had received other vaccines; if the children who may have received BCG were censored in the analysis the result was essentially the same (Supplementary Table 2). The 3-monthly community examinations assured that we had follow-up information for all children and relatively accurate information on the time of death. Some children were excluded because a BHP card could not be found and we did not know whether they had been vaccinated or were travelling. Most likely, BHP cards may never have been made because the child was not coming for examination, or the card may have disappeared at community examinations, at the later handling of BHP cards by field workers or data entry clerks, or due to mice. However, the few missing cards are unlikely to have affected the main analysis as the mortality rate in this group was similar to the general mortality rate (Fig. 2). To assure comparability of vaccinated and unvaccinated groups, also with respect to travelling, we included only children who had been weighed in Bandim in connection with the 3-monthly community examinations. This meant that children who mostly stayed outside the area were not included in the analysis; these children had no access to community vaccinations and they lived elsewhere where the mortality risk might have been quite different, e.g. due to a higher risk of malaria infection. The present study was not a planned trial. The study would have been a cleaner natural experiment if vaccinations had only been administered at the weighing sessions. However, the expatriate nurse did organize additional vaccinations and some ‘unvaccinated’ children had therefore already received a vaccination before coming for a weighing session. These ‘misclassifications’ do not explain the increased mortality in the DTP group. The estimate for DTP-vaccinated (± OPV) compared with DTP-unvaccinated children was 4-fold higher mortality when we included these additional landmarks in the analysis. There is only one other study of the introduction of DTP. In rural Guinea-Bissau, DTP (± OPV) was associated with 2-fold higher mortality (Aaby et al., 2004a). All studies that documented vaccination status and followed children prospectively indicate that DTP has negative effects; a meta-analysis of the eight studies found 2-fold higher mortality for DTP-vaccinated compared with DTP-unvaccinated, mostly BCG-vaccinated controls (Aaby et al., 2016) (Appendix A). The negative effect of DTP was much worse in this natural experiment than has been reported in previous studies of DTP. This is presumably due to the “unvaccinated” control children in previous studies having been a frail subgroup too frail to get vaccinated. Previous studies have not been able to compare DTP-vaccinated children with “normal” controls. Hence, most previous studies have probably underestimated the negative effect of DTP. The potentially differential effects of DTP and OPV have only been examined in few studies. However, we have recently been able to document marked beneficial NSEs of OPV. In an RCT, OPV at birth (OPV0) reduced infant mortality by 32% (0–57%) before the children received campaign-OPV (Lund et al., 2015). In Bissau campaign-OPV reduced the mortality rate by 19% (5–32%) (submitted). When DTP was missing for several months in Bissau, we showed that the all-cause case-fatality at the pediatric ward was 3-fold lower if the children had OPV-only as their most recent vaccination rather than the recommended combination of DTP and OPV (Aaby et al., 2004b). Thus, OPV may have modified the negative effect of DTP. This pattern was also seen when DTP was first introduced in the rural areas of Guinea-Bissau in 1984 (Aaby et al., 2004a). OPV was not used the first year and the HR for DTP versus unvaccinated was 5.00 (0.63–39.7). In the period from 1985 to 1987, when DTP and OPV were nearly always administered together, the MRR was 1.90 (0.91–3.97). In the present study, the hazard ratio was 10.0 (2.61–38.6) for DTP-only but 3.52 (0.96–12.9) for children who received DTP and OPV simultaneously (Table 3). Based on these two studies of the introduction of DTP, the HR compared with DTP-unvaccinated children was significantly different for children who had received DTP-only (HR = 8.14 (2.63–15.2)) and for children who received both DTP and OPV (HR = 2.21 (1.16–4.19)) (test of interaction, p = 0.049). Hence, simultaneous administration of DTP and OPV may have alleviated the negative non-specific effect of DTP. The recently published SAGE review called for randomized trials of DTP (Higgins et al., 2014). However, at the same time the IVIR-AC committee to which SAGE delegated the follow-up studies of the NSEs of vaccines has indicated that it will not be possible to examine the effect of DTP in an unbiased way. If that decision by IVIR-AC remains unchallenged, the present study may remain the closest we will ever come to a RCT of the NSEs of DTP. The present study and cleaning of the original data was supported by a common grant from DANIDA and the Novo Nordisk Foundation (FU-11-551). The work on non-specific effects of vaccines has been supported by the Danish Council for Development Research, Ministry of Foreign Affairs, Denmark [grant number 104.Dan.8.f. ], Novo Nordisk Foundation and European Union FP7 support for OPTIMUNISE (grant: Health-F3-2011-261375). CSB held a starting grant from the ERC (ERC-2009-StG-243149). CVIVA is supported by a grant from the Danish National Research Foundation (DNRF108). PA held a research professorship grant from the Novo Nordisk Foundation. The issue of DTP vaccination and child mortality in high mortality areas was raised 15 years ago when a study from rural Guinea-Bissau showed 1.84-fold higher mortality for children who had received DTP1 vaccination (Aaby et al., 2016, Kristensen et al., 2000). All subsequent prospective studies have supported a negative effect (Aaby et al., 2016). Furthermore, DTP may have a negative effect when given simultaneously with or after MV (Aaby et al., 2003b, Aaby et al., 2012). For example, the negative effect of high-titer measles vaccination (HTMV) in girls, which led to the global withdrawal of HTMV, was due to DTP being administered after MV because HTMV had been given early at 4–5 months of age (Aaby et al., 2003b). DTP has not been shown to have beneficial effects in RCTs or natural experiments. The current policy for DTP has only been examined by reanalyses of existing data sets collected for other purposes. All such studies have had methodological problems related to different forms of frailty and survival bias (Aaby et al., 2012). These studies have updated follow-up time for DTP-vaccinated children who survived but children who died without their vaccination status being documented were classified as “unvaccinated”. Such procedures give a misleading high mortality rate in the unvaccinated group, and the comparison of DTP-vaccinated survivors and “unvaccinated” children will therefore give a beneficial estimate for DTP (Aaby et al., 2016). If the mortality rate of unvaccinated children is unnaturally increased, the HR of unvaccinated children versus children who have received at least one vaccine may indicate how much bias there might be in the study, and we have called this HR the “bias-index”. All studies with prospective follow-up have had a bias index below 2.0 (Aaby et al., 2016); in the present study the bias index was 0.41 (0.15–1.15) in the 3–5 months age group (Supplementary Table 2). In studies with survival bias and unnaturally high mortality in the unvaccinated group, the bias index has been 3–8 times higher (Aaby et al., 2016). SAGE recently reviewed the potential NSEs of BCG, MV and DTP (Higgins et al., 2014, Strategic Advisory Group of Experts on Immunization, 2014). The reviewers indicated that the majority of studies showed a deleterious effect of DTP but they concluded that the results were inconsistent because two studies showed a beneficial effect. The beneficial effect in these studies was not surprising because the mortality rate in the unvaccinated group was unnaturally high, and the bias index was 3.40 (2.93–3.95) and 7.52 (5.15–10.97), respectively (Aaby et al., 2016). SAGE's working group on non-specific effects of vaccines further emphasized that the overall effect remains unclear because DTP has been given in combination with other vaccines and under circumstances where the burden of the target diseases has been reduced to a very low level. However, several previous studies have shown that the negative effect of DTP-plus-OPV was not due to OPV (Aaby et al., 2004a, Aaby et al., 2004b, Aaby et al., 2012). OPV has probably reduced the overall negative effect of DTP. Previous studies have indicated that DTP (± OPV) was associated with a 2-fold higher mortality than DTP-unvaccinated children (Aaby et al., 2016). Since pertussis did not account for > 5–6% of infant deaths in the only existing African study of the impact of pertussis on child mortality (Mahieu et al., 1978), it is not surprising that DTP is also associated with a strong negative effect prior to vaccine-induced herd immunity (Aaby et al., 2012). 12 Expanded Programme on Immunization The optimal age for measles immunization. Wkly. Epidemiol. Rec. 1982;57:89–91. 20 Strategic Advisory Group of Experts on Immunization Wkly. Epidemiol. Rec. 2014;89:233–235. 21 SAGE Non-specific Effects of Vaccines Working Group . Background paper for SAGE discussions; Geneva: 2014. Evidence Based Recommendations on Non-specific Effects of BCG, DTP-Containing and Measles-Containing Vaccines on Mortality in Children under 5 years of Age.